An antenna consisting of two conducting surfaces intersecting at an angle that is usually 90°, with a dipole or other antenna located on the bisector of the angle. A reflector which returns a laser beam in the direction of its source, consisting of perpendicular reflecting surfaces; used to make precise determinations of distances in surveying. an artificial ranging target with a large target cross section that is weakly dependent on the angle of incidence of electromagnetic waves. The target cross section Seff is the area of a hypothetical flat target having the same reflection coefficient in a specified direction as does the given target. Corner reflectors are used in radar and in optical detection and ranging. Radar corner reflectors consist of three mutually perpendicular metallic surfaces, usually of rectangular or triangular shape. A ray that is incident on one of the surfaces at a small angle θ to the bisector of the trihedral angle is returned in the direction of the radiation source after triple reflection. For rays that arrive within a substantial solid angle, a corner reflector is similar to a mirror. The value of Seff is a function of the angle of incidence θ and varies in proportion to cos θ. The highest value of Seff is achieved when the incident ray coincides with the bisector of the trihedral angle. For a corner reflector with square faces the maximum target cross section Seff max = 12πa4/λ2, and for one with triangular faces Seff = 4πa4/3λ2, where a is the side of the square or the leg of the right triangle and λ is the wavelength. For example, when a = 1 m and λ = 1.5 m, Seff = 17 m2, which corresponds to the effective reflecting surface of a small aircraft, such as a fighter; when α = 1 m and λ = 10 cm, Seff = 3.77 × 103 m2, which is equivalent to the effective reflecting surface of a large oceangoing vessel. A corner reflector is an effective reflector within the limits of the first octant of a sphere. To obtain an omnidirectional reflector, eight corner reflectors are combined. The faces of a corner reflector are often made of metallic mesh in order to reduce its weight. Corner reflectors are installed on, for example, navigational buoys, lifeboats, and the approaches to airfields. The identification of a radar image from a corner reflector is facilitated by making one of the reflector’s faces vibrate, thereby modulating the intensity of the reflected signal at the site of reception. The action of a corner reflector in the optical range is based on the same principle as that of a radar corner reflector. An optical corner reflector is a small trihedral prism made of transparent glass; its faces, which have an area of about 1 cm2, are coated with a thin metallic layer. Such a corner reflector has a high Seffbecause the ratio a/λ is large. To obtain an omnidirectional corner reflector, a system of several such prisms is used. Optical corner reflectors became widespread after the advent of the laser. Examples of their use include navigation, the measurement of distances and the speed of light in the atmosphere, and lunar-ranging experiments. Optical corner reflectors in the form of colored glass with many tetrahedron-shaped depressions are used as a means of signaling in automotive transport and in daily life. i. A passive ECM (electronic countermeasure) device, normally consisting of three metallic surfaces or screens perpendicular to one another. It is designed to act as a radar target or marker by producing a very strong radar echo. The returned echo by the reflector stands out and thus confuses the radar operator. ii. A device for producing antenna gain at very high frequencies and above. It consists of two flat metal sheets or screens, which are placed behind the radiating element of the antenna to produce forward gain. The gain is the same for reception as for transmission at the same frequency. 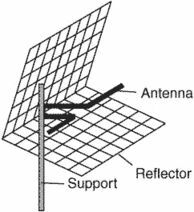 Corner-reflector antennae are often used for reception of television broadcast signals in the UHF (ultrahigh frequency) band. iii. In radar interpretation, an object that, by means of multiple reflections from smooth surfaces, produces a radar return of greater magnitude than might be expected from the physical size of the object. The US Navy has more recently opted for the rapid response capability offered by RF decoys based on corner reflectors. Introduced into service by mid-2000s, the 150 mm diameter Sealem 15-01/15-02 (1650/1800 mm length) rockets deploy corner reflectors that generate customer-tailored RCS over the duration required by of all tactical engagements (centroid seduction, distraction/seduction and dilution). Another aspect worth to mention is that not only simple corner reflectors but also a vehicle is deployed in the test site, which is more persuadable. Figure 2(g) is the 3-D imaging result of the corner reflector via matched filtering in top-view, side-view, front-view and 3-D view respectively. The observed objects are a goods van and a corner reflector, which are shown in Figures 5(b) and (c) respectively. Airborne Systems corner reflector decoys have been fitted to the UK Royal Navy frigates since 1986, with the latest version for the UK Royal Navy entering service in 2006, including their latest Type 45 Destroyer. When we analyzed the sort of echo with which our confusion system would have to compete, it soon became clear that the idea of using corner reflectors was a non-starter: we would have needed such an enormous number that the scheme would have been unworkable. With its distinct, soft and crisp angular design, the enclosure has the appearance and feel of a stealth vehicle because of its re-entrant triangles, corner reflectors and platform alignments. The Young Turks of the radio amateur field are eager to take the antenna by the horn and blast away with endfire and backfire antennas, Yagis, rhomboid antennas, corner reflectors and helical radiators. Each survey station includes a pair of radar corner reflectors that are visible in the satellite radar images. Towed barges, for ships, use large corner reflectors and could also be considered towed decoys, but they are typically considered separately. Active ECMs have many advantages over passive ECMs, such as chaff and corner reflectors and the author goes into great detail describing the function of each.